Description: These two wooden box mines are similar to the schü mine although somewhat larger. Both A and B types are very similar, consisting of a wooden box containing 6 kg picric acid in damp proof paper. The initiating charge in each case is a standard 200gm charge built up on wooden blocks to enable the igniter to fit into it. 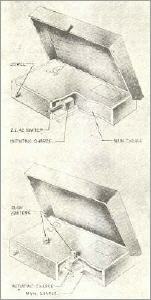 On the inside cover of the box is painted the letter A or B showing the type of mine, and a label, giving instructions for installation. Operation: Type A is actuated by pressure on the box lid, causig the shearing of two ½-inch wooden dowels and pressing out the link pin of the ZZ42 igniter. Type B is actuated by pressure on the box lid shearing ¾-inch wooden dowels and exerting pressure on the head of the two Buck chemical igniters. 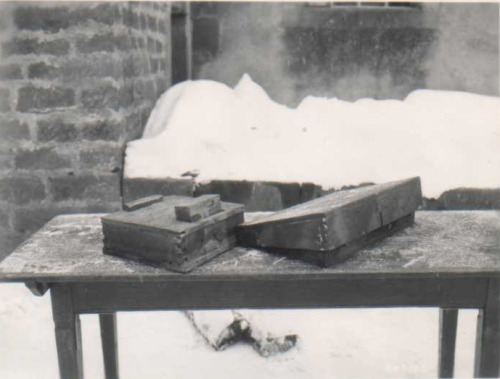 Photo below shows the "A" model next to the Holzmine42.